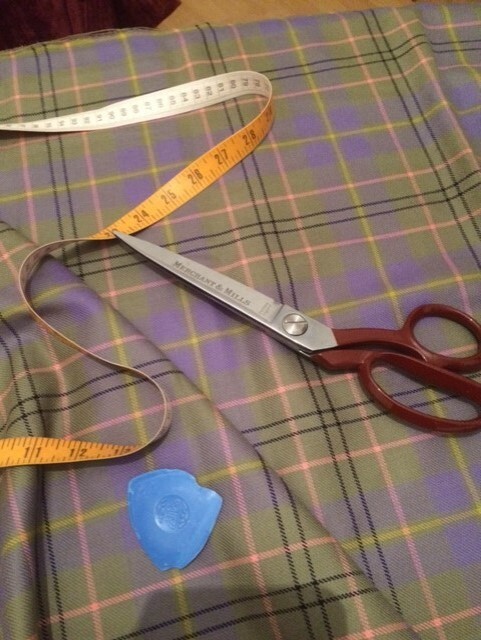 When we talk about the tartan kilt there’s no doubt that it’s one of the most distinctive and recognisable national dress in the western world. Worldwide there are women, and men, swooning at the sight of a man in a kilt. C’mon readers I know you’re all thinking about it. 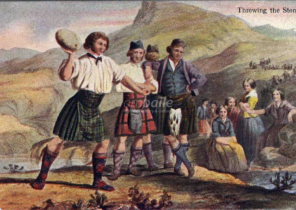 We’re now in a time when most national dress is either mocked and or dying out, but us, the Scots, are proudly embracing ours, just as our ancestors did throughout the centuries, and we are still to this day allowing it to evolve with us. 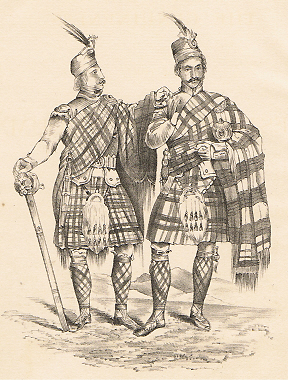 The kilt is often seen around the world as romantic visions of a highlanders, this is a lot to do with Sir Walter Scott and his obsession with re writing Scottish cultural history with rose tinted glasses. The truth is that it started out more as a functional item long before industrialisation. However, we find that most cultures around the world would have had a similar garments when working the land. We also seem to think that ours was more unique because of the criss cross weave of the pattern in the cloth, but again I’m sure other cultures would have had something similar. 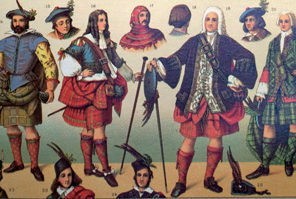 What does make our cloth unique is that we have embraced the weave of the patterns, just as we have with the kilt, and given different meanings to them through the years which give us the beautiful garments we see today. Some of the first written evidence of a kilt like garment that we see is a publication from 1582 of a 25 volume called ‘The History Of Scotland’. 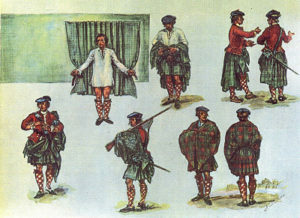 The author George Buchanan describes the kilt as consisting of a tightly woven cross striped woollen length of cloth worn as a garment by day and blanket by night. This is a description of what we would call a belted plaid or a great kilt. It was a large piece of woollen cloth that may have had the criss cross weave or just a plain one, depending on how adventurous the local weaver was, and was around 2 yards wide and 4 – 5 yards in length. 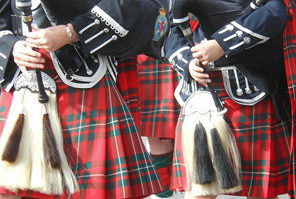 The Highlander would lay the cloth down, pleat the middle section, wrap it around the body with a belt. By tucking in the corners you can make pockets. If you ever go to Scottish battle re-enactments or memorials, go down to the car park, its quite a sight watching the gentlemen taking part putting on their plaids. Just for the record I only watch to make sure they’re doing it right, honest. The bottom part of the kilt would’ve been a lot shorter than what we are use to today. The reason for this is very simple, Scotlands weather, four seasons in one day, when walking through wet heather, or walking in the rain and snow, the cloth would get wet, it would then harden and if it was the length we have today, it would cut the back of the legs. 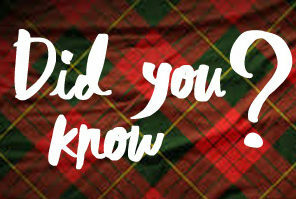 As late as the 1960s the majority of kilts were being worn well above the knee. When I first started in the early 90s some of the older gentlemen were still wearing them like this and believe me its not a nice sight for a wee 16 year old lassie. There was a very clever firm who shall remain nameless, marketed, very successfully, a ‘new’ style of kilt called the hillwalker kilt This was a normal kilt but made shorter so when you’re up in the wet heather you’ll not cut the back of your legs. How clever, wonder why we didn’t think of it before. Now for a wee mental image. Tradition says that when the highlanders were about to run into battle with the famous Highland Charge, they would simply undo their belts and allow the plaids to drop to the ground so they could run and fight unhindered and quite possibly give their enemy quite a fright. I’m thinking most opposing armies would turn and run, could you imagine that today.